Have you seen the Hollywood film that flashes back to February, 2006, when Palestinians elected a Hamas party parliamentary majority. I didn’t think so, because there is no such film available. An honest film on Palestine’s current situation would begin in present-day Gaza. A Palestinian baby lies in a tiny crib, dying because the hospital lacks sufficient electricity to keep her alive. The poorly-maintained portable generator outside in the yard, would have run out of fuel. Then, in a flashback, the film would show long lines of voters in occupied 2006 Palestine, waiting their turn in an election monitored by outsiders including President Jimmy Carter. Hamas won that 2006 general election, defeating the Fatah party which had been in power since Yasir Arafat was allowed by Israel to return to Gaza in the summer of 1994. Mahmoud Abbas succeeded Arafat as head of the PLO and the Palestinian National Authority in November, 2004. Israel and the US agreed to the holding of that 2006 parliamentary election, a year after Mahmoud Abbas was elected president of the state of Palestine May 8, 2005. The Israel/US combine and the Fatah leaders had assumed a Fatah victory. The voters thought otherwise, handing a national parliamentary majority to the Hamas party. And it was a “political party”. Once Hamas emerged as a formidable adversary, thanks to Israel’s control of its own narrative, the “terrorist” label was hung around its neck. Indeed, the first time I ever heard of Hamas, was from a member of the Israeli foreign ministry who told me to “keep an eye on this Hamas. They are doing good work for the poor”. The purpose of that praise, I later realized, was to build up an enemy against Arafat, a long-time Israeli foe. As the ancient proverb reminds us, “The enemy of my enemy is my friend”. To correct its 2006 political venture into democracy, Israel and the US instituted a war to defeat Hamas in 2007. The Fatah army was trained and guided by the George Bush-run CIA. Fatah lost the war to Hamas just as it had lost the parliamentary election one year earlier. Tired of trying to resolve its pesky Gaza problem with proxies, Israel arrested 25% of the Palestinian legislators and sent them off to jail, many of them with no charges, just indefinite jail sentences. Throughout modern Israel’s history, its focus has remained on doing what it takes to control the land from the sea to the river. Its concern for the indigenous Palestinian population is to hope it will dwindle away. At the start of the recent prisoners’ hunger strike in Palestine, Daoud Kuttab anticipated Israel’s 50-year celebration of its seizure of all Palestinian land in 1967. Palestinians have lost hope in an internationally sponsored negotiated settlement. But this discontent has not turned off their desire for freedom and independence. Instead, more and more Palestinians are using nonviolent acts of resistance to keep the flame alive and to remind the Israelis and the world of the importance of a peaceful solution that will end the occupation. The hunger strike was the latest nonviolent resistance employed by Palestinians, protesting, at personal cost, the imprisonment of Palestinians. Palestinian nonviolent resistance moved into Israeli jails, where 6,500 Palestinians are being held, including 300 children, 500 prisoners detained without trial on administrative orders and 13 elected Palestinian legislators. Fifteen hundred of the detainees have begun a hunger strike. Initiated on Palestinian Prisoner day, April 17, and led by Marwan Barghouti, the most prominent leader of the PLO’s Fatah movement and an elected member of the Palestinian Legislative Council, the prisoners are demanding basic visitation rights and an end to imprisonments without charge or trial. The strike ended after 41 days as Israel offered a compromise deal to meet some of the strikers’ visitation demands. Falk also called attention to a “poignant dispatch” from a “leading intellectual resident of Gaza, Haider Eid, from the front lines of continuous flagrant Israeli criminality”. Falk is an international law and international relations scholar who taught at Princeton University for forty years. Less than a month later, the Electronic Intifada’s Charlotte Silver describes how Israel controls the electric grid supplying power to the Gaza civilian population of over 1.8 million. Israel reduced its supply of electricity to the occupied Gaza Strip Monday morning, (June 19) in spite of warnings from human rights groups that the move violates international law. The cuts come despite dire warnings in recent weeks from the International Committee of the Red Cross, the World Health Organization and UN officials that the induced electricity shortage is causing a humanitarian catastrophe. Israel does not call its military control an “occupation”. According to Israel, it is “administering” the lands of Judea and Samaria (AKA by the non-Zionist world as the West Bank and Gaza). As for the electricity, well, to hear Israel tell it, the shortage is not Israel’s “fault”. As the wolf told the farmer from inside the noisy chicken house, “there ain’t nobody in here but us chickens”. There are wolves in those “administered territories” and they are in total control of the hen house. Israel hauled out its number-one major media ally in the US. the New York Times, to print Israel’s version of the hen house “truth”. Under the headline, Challenging Hamas, Palestinian Authority Cuts Electricity Payments for Gaza, the Times blames the chickens for bickering among themselves. The Palestinian Authority informed Israel on Thursday that it would no longer pay for the electricity that Israel supplies to the Gaza Strip, in an extraordinary push by the authority to reassert some control after years of rule in Gaza by the militant group Hamas. The schism between the Palestinian Authority, which is based in the West Bank and led by President Mahmoud Abbas, and Hamas, which seized full control of Gaza in 2007, has left Palestinians deeply divided and has hurt efforts to reach a peace deal with Israel. Israel and the Times expect us to believe the Gaza electric grid is turned off and on with the consent of the Fatah wing of the Palestinian government? The wolves expect us to believe such nonsense? Of course, Israeli spin-masters do not say they condone the power reduction. They blame President Abbas for “using” the reduction for his own political benefit. A check of international media confirms that it is buying the Israeli nonsense. The Israelis are media-savvy. They know internal political conflict is sexier than babies dying. Responsibility for a territory under occupation always lies with the occupier. It would be foolish to let Netanyahu get away with blaming Abbas for those Gaza deaths. Which calls to mind a scene in Bonnie and Clyde when Clyde shoots a shop-keeper he has just robbed. Clyde keeps driving and laments to Bonnie, “Why did he make me do that”? 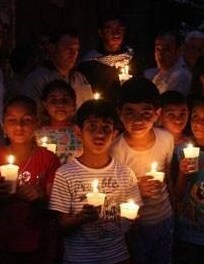 The picture of the children with candles is from the Bethlehem-based Ma’an. This entry was posted in Gaza, Israel, Jimmy Carter, Middle East Politics, Netanyahu. Bookmark the permalink. ISRAEL is despicable as is US support! Superb; thank you. Israel is as much a pariah state as the deep-state-controlled US is a dishonest broker. Clear description from a trusted journalist who has seen the region with his own eyes on numerous occasions. Gaza is in a desperate situation and the despicable treatment by Israel and its Western supporters will further discourage peacemaking. Thanks,Jim! Thank you for the ‘real’ news you always publish, against the ‘Fake News’ that Israel has mastered. It started with its fake narrative in the West stating that, “Palestine was a land without people, for a people without land”, to “justify” its occupation, Stage I (1948). Israel continues its mastery of fabrications and manipulation of an open-door-welcome mat by our media, for publication of fake news, distortions, and distractions. Israel, periodically, comes out with well planned and executed painful distractions that keep the Palestinians preoccupied, by responding to each of them (Electricity is only the latest example).. The Palestinians have to keep their eyes on the ball and continue focusing on the “CORE ISSUE”: The tyrannical despotic, OCCUPATION of Palestine. Not Gaza; not East Jerusalem; not West Bank. But of Palestine. As your article correctly mentions Hamas was democratically elected by the Palestinian people, in 2006. The election results were a manifestation of despair by the Palestinian people because all the peaceful measures taken by the PA (Palestinian Authority) had failed, due to Israel’s continued building and expansion of Israeli settlements in East Jerusalem and West Bank, and the strangulation of Gaza, the “world’s Largest Open-Air Prison”. The US, obediently, followed the lead of Israel by denying the implementation of the democratic elections from being executed in Palestine, or even in Gaza. Finally, when the PA and Hamas declared that they were going to have a “Unity Government”, Israel was outraged and Netanyahu threatened that Israel will never allow this to happen. This was in total contradiction to his previous feeble excuses that Israel could not reach an agreement with a “divided” Palestinian government. In fact, the real reason behind Israel’s invasion of Gaza in 2014, was to prevent the formation of ONE UNITED Palestinian Government over the 1967-occupied territories. Israel is preparing to invade Gaza, once more, (It’s been 2 years after all) in order to enable a feeble Palestinian client state implement Israeli plans of continued occupation and ethnic cleansing.